During my holidays in August 1968 I had the opportunity to see and hear the famed 610 mm gauge Hudswell Clarke 0-6-0 steam locomotives used by the Colonial Sugar Refining Company at their sugar mills in Queensland and Fiji. The last ten of these locomotives at that time worked in the Ingham District at the CSR Victoria and Macknade mills. The oldest was also the smallest, the Homebush, built in 1914. The remainder ranged in size and weight with the last built in 1953 being the largest and most powerful. I took many photographs of these locomotives at work and also made tape recordings as they worked hard with some big loads. The first recording I made of a Macknade locomotive ascending the 1 in 40 grade from the Herbert River Bridge at Cordelia with 44 sugar box wagons loaded with raw sugar (over 450 tonnes) destined for Lucinda Point Bulk Sugar Terminal was particularly memorable. During my 1968 visit I became friends with a Macknade Mill cane inspector, Ian Stocks. Ian reminded me earlier this year that the little 0-6-0 locomotive Homebush, would be celebrating its 100th Birthday in 2014. Homebush had been preserved in working order at the Victoria Mill by CSR, following the end of steam locomotive use in 1976. Ian made approaches to Wilmar Sugar, the current owners of CSR’s sugar assets in Queensland, suggesting that the occasion be celebrated in some way. Ian, myself and another railway historian, John Browning felt that the occasion warranted a book be written about the Hudswell Clarke locomotives. From the time of their introduction to the CSR mills in 1912 the Hudswell Clarke 0-6-0 locomotives became an icon of the Company’s cane railway systems. The locomotives remaining in 1968 were always resplendent with clean paint and highly polished brasswork, especially their large steam domes. The locomotive now named Homebush had originally been built for the CSR Homebush Mill, near Mackay. When Homebush Mill closed in 1921 the little locomotive was transferred to the CSR Victoria Mill at Ingham, where it was named Homebush. 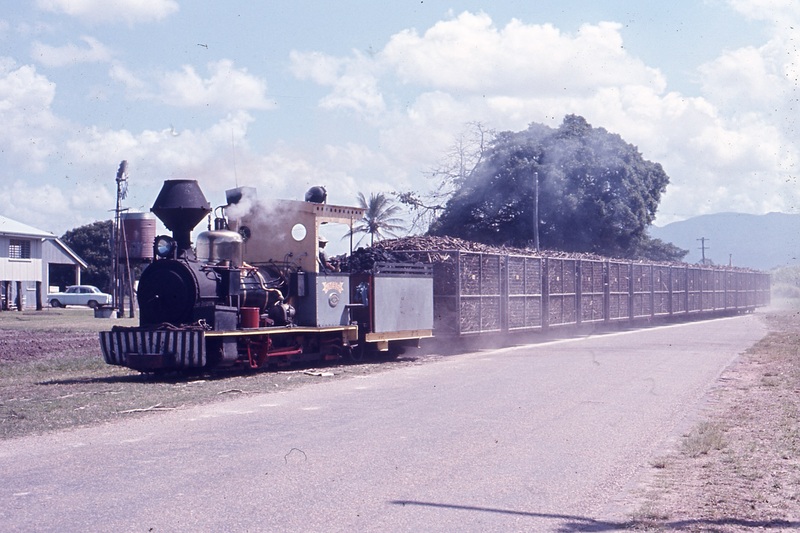 Besides hauling sugar cane Homebush was also used at various times to haul passengers and portable track until steam traction ceased at the end of the 1976 season. Since 1976, when Homebush was preserved, it has been operated on special occasions for the enjoyment of local people and visitors. This tradition has been continued by Singapore-based Wilmar International following its takeover of CSR’s sugar assets in 2010. To mark Homebush’s 100th birthday, Wilmar arranged for the locomotive to work the first train load of sugar cane to the Victoria Mill on 23 June, 2014. 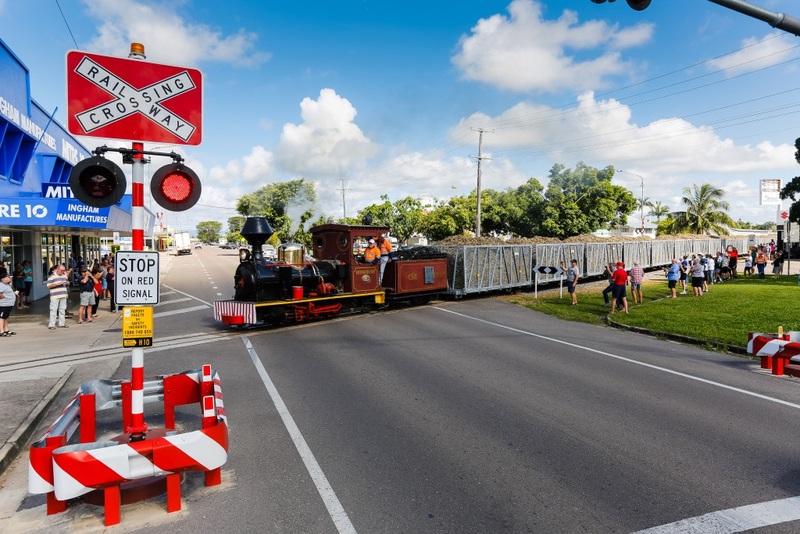 This was a memorable moment as it is the first time since 1976 that a steam locomotive has been used to haul sugar cane. Cheered on by local residents and visitors, the preserved Homebush locomotive, celebrates her 100th birthday, crossing Herbert Street, Ingham with the first load of sugar cane for the Victoria Mill on the 23 June 2014 marking the commencement of the 2014 crushing season. Meanwhile, Ian Stocks and John Browning and I worked together to produce a book about CSR’s Hudswell Clarke locomotives. Initially it was to be a photographic book but as we embarked on this journey it became a history book about the CSR Hudswell Clarkes in Fiji and Queensland supplemented with many photographs. We have undertaken research stretching from Australia to Fiji, the United Kingdom and the United States, drawing on the knowledge and photographs of many people from around the world. The Noel Butlin Archives Centre at the Australian National University in Canberra, who hold much of CSR’s records, has been one of the many important sources of information. The project came to fruition with a special function in Ingham on the 11 October when the book, Salute to the Hudswells, was officially launched by Wilmar Sugar. I am pleased that the project that Ian, John and I had set ourselves nine months ago, has culminated in the publication of this book.